Few would argue that smart switches are the foundation on which a fully integrated smart home is built, regardless which flavour you choose, z wave or zigbee. Everyone is talking about how these devices allow you the remote access and control of features in your home that open up a whole world of possibilities for additional home comfort, peace of mind and ultimately a new way of living. Each one of us at sometime has arrived home to an unwelcoming dark home devoid of light, or to a stuffy bedroom where our first job is to rush to switch on the fan. Or have you ever wondered on the second day of your holiday, whether you did in fact turn the lights off before leaving and worried about it for your entire stay. With smart switches these concerns are things of the past. Although we always think first about smart switches controlling home lighting, they can be used for anything in your home that is controlled by a conventional switch. External as well as internal lighting, ceiling fans, bathroom fans, air conditioning and even to check whether you have switched off the fireplace. And smart switches don’t have to be single switches. They come with the same, two, three or even four gang options as conventional switches. There are also options available if you don't have a neutral wire in your existing gang-box. Taking it a stage further, smart switches don’t have to be simple on/off switches, they can be dimmers, so allowing even more control. Smart switches and smart dimmers are no ordinary products, they are very sophisticated and are embedded with the latest hardware technology has on offer. They can connect to our home Wi-Fi networks, either directly or indirectly via a smart home hub, allowing us to remotely access them through a computer or a smartphone. So we can control other rooms in our home without moving from the couch or to control several rooms from far away, to prepare our home for when we arrive back from a short trip or a much needed holiday. All we need is our phone. you can set a home schedule such as turning your lights on just when the sun starts to set and all of the lights off after the sun rises. In this article, we're taking a close look at some of the best smart switches and dimmers currently available, our aim is to help you find just the right one for your needs. And before we dive in, we suggest reading up on the difference between smart bulbs vs smart switches to make sure you get exactly what you need! Few would argue that smart light switches are the foundation on which a fully integrated smart home is built. However, if you start looking for the right switch for your home, you'd soon realize that it can be quite difficult to differentiate between all of the choices that are available. Don't worry. This is where we come in. We will help you figure out the best smart light switch for your home. You probably have to decide between getting a smart switch or a smart plug. Both of them are incredibly convenient and toggling them is just as natural as a standard light switch. If you want to keep your conventional switches but still automate your lights, then you would want to go for a smart light switch. Smart plugs, on the other hand, don't have the same manual switches but include sophisticated power monitoring features that most switches don't offer. The choice of software or operating system is just as important as the hardware. Although most devices will work on both Android and iOS, some switches will work better with one operating system and sync well with your existing devices such as Nest or Ecobee. We usually don't give much thought to wireless connectivity, but there is more to it than just Wi-Fi. Wi-Fi, ZigBee, Z-Wave, and Bluetooth are some of the most commonly used medium for wireless communication. Each of these communication protocols has their own advantages and disadvantages, and you want to make sure that you opt for the right protocol for wireless communication in order to ensure seamless connectivity between all of the devices in your home. TP-Link’s Smart Wi-Fi Light Switch is designed to work with Google Assistant and Amazon Alexa. It features a unique app named, Kasa, which can be used to remotely control devices that are connected to the smart light switch. It not only offers the ability to turn the lights on and off but also a number of other vital features that will provide you with total control over your home. It can also be used as a security system for the home. Its app can be used create a schedule for turning the lights on and off at different times throughout the day, giving the appearance of an occupied home and deterring potential break-ins. The same feature can be used to prevent waste of electricity as lights would automatically turn off after sunrise even if the occupants of the home are sound asleep. The smart light switch offers incredible convenience due to its state-of-the-art voice control system. Since it works seamlessly with both, Amazon Alexa and Google Assistant, most of its functions can be automated to work on voice commands. All it requires is that each switch is assigned a name and that name can be used to activate that particular switch to receive voice commands. Moreover, it also allows us to create a group for all of the switches or other smart devices and use it to control all of the smart devices with a single voice command. 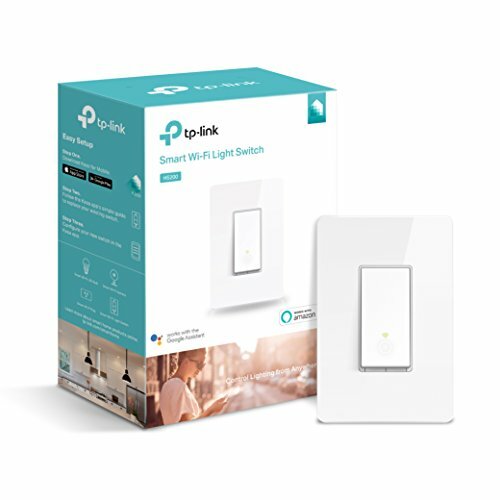 Unlike many of the smart light switches, TP-Link Smart Wi-Fi Switch does not require a separate hub or any other kind of paid subscription service to work. It can be easily connected with any kind of Wi-Fi router without affecting any of its core functionalities. The smart light switch is compatible with 120V 15A and works perfectly with a single-pole setup. It does, however, require a neutral wire in order to be connected to a power source. 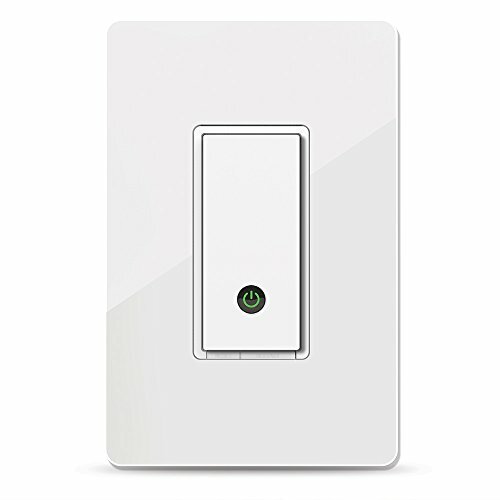 Wemo Light Switch is a highly efficient and incredibly practical smart switch that can replace almost all types of conventional light switches. It can work with almost any kind of one-way connection light, and it can also connect to a number of small electronic appliances. Its installation does require a neutral wire as most other smart light switches do. The smart light switch comes with its own highly intuitive and easy-to-use smartphone app. Once a network of switches and smart devices has been established, a single app can turn into a powerful control panel for the entire home, allowing you to control almost all aspects of your home from a smartphone app. It can be used to create an automated schedule for lighting and heating to create a warm and welcoming home after a long day at work. It can also be used to set the ceiling fans to automatically start when a certain temperature is detected by the smart thermostat. It works with Amazon Alexa, which is a prerequisite for voice control. If you’re using Amazon Alexa, can you create a number of different types of voice commands and attaint the ultimate form of convenience. It can even work as a dimmer as long as the lights are dimmable. It can also be used to control ceiling fans. It works perfectly with all types of lights. However, it is not compatible with lights that are controlled by multiple switches, which isn’t really a problem as it merely requires a small adjustment during the installation process. As mentioned earlier, it offers compatibility with Nest Thermostat, which means the switch will be able to receive information from the smart thermostat as well and turn the lights off when you leave home and turn them back on when you re-enter your home. The app for the smart light switch can work on Android 4.1 and higher as well as iOS 8 and higher. 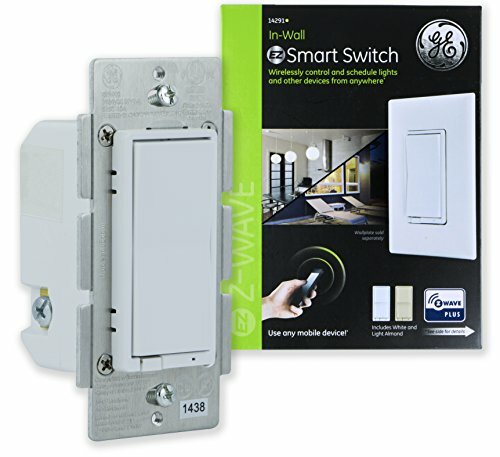 GE’ Z-Wave Wireless Smart Lighting Control Smart Switch is carefully engineered to replicate most of the standard in-wall lighting switch. It offers a simple interface to remotely control lighting fixtures and ceiling fans using a smartphone app as well as the certified Z-Wave gateway portal for computers. The smart light switch’s software offers remote control of individual as well as groups of lights, which can be used for turning the lights on and off as well as for creating ambient interior lighting. The switch is compatible with other hubs that are certified by Z-Wave: Trane, Pulse, Nexia, Wink, HomeSeer, Honeywell, Harmony Home Hub, Smart Security, Iris, Extender, Connect and Vera. It has a simplified installation system with a screw-based terminal for improved space efficiency as well as easy replacement of existing smart light switches. The Wireless Smart Light Switch is also compatible with Amazon Alexa. However, successful connectivity does require one of the aforementioned Z-Wave certified smart hubs. Its most attractive feature is that it belongs to the world's largest ecosystem of interoperable smart home devices. Z-Wave network of smart home devices is one of the best ways to create a fully integrated smart home that syncs perfectly with each and every device to create a truly intelligent home. The Z-Wave platform interface offers the ultimate flexibility in terms of what you can get from your smart light switch. We can use it to create a time schedule for lights to turn on and off at a predetermined time. But that's not all. It can also be used to create scheduled customized lighting scenes or ambiances for specific times. For example, the lights would automatically dim down after dinner time when the family lounges around together before everyone heads into their bedrooms for a good night's rest. Lastly, the smart light switch supports literally all of the different types of bulbs such as LED, fluorescent, CFL, halogen and Xenon lights. 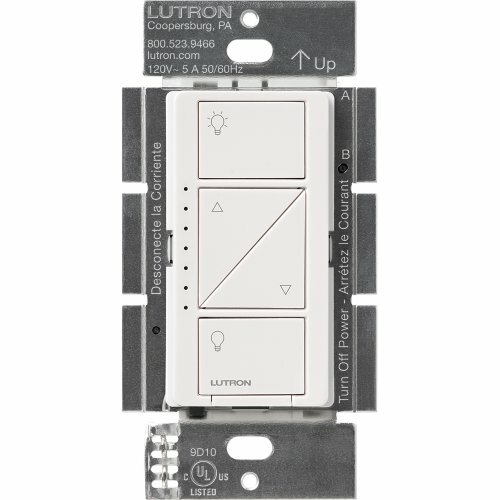 Lutron’s PD Caseta Wireless Smart Dimmer Switch is a smart light switch that works with Amazon Alexa to offer voice control over the house’s entire lighting system. It can be used to turn the lights on and off as well as the ability to adjust the brightness of the lights with simple voice commands. However, the use of Amazon Alexa does require a smart hub for seamless integration of all smart devices including the smart light switch. Although it is compatible with all types of lights and bulbs, it works best with LED bulbs that are more responsive to ambient lighting and are conducive to brightness adjustment. It is also compatible with a Pico remote control, available separately, for those not inclined to get a smart hub or simply don't prefer voice commands for lighting control. The smart light switch can support lights with a wattage of up to 600-Watts Halogen and Incandescent bulbs, as well as 150-watt dimmable CFL and LED bulbs. As for the smart hub, it supports Lutron’s Smart Bridge and WINK hub for remote control of the lights through a smartphone. Aside from Amazon Alexa it also supports other personal assistants and smart devices such as Google Assistant, Nest, Logitech, Sonos, Apple Homekit, Honeywell, Carrier Cor, Samsung SmartThings, Serena Shades, Ecobee and more. Since Caseta Smart Light Switch doesn't require a neutral wire, it is a perfect choice for old homes that lack a neutral wire in the structure's wiring system. Moreover, it offers by far the simplest and easiest installation process, which requires no more than just 15 minutes. Lastly, the smart light switch is available in four different colors for aesthetic compatibility. It is available in white, light almond, ivory and black. Why Shouldn’t I Just Stick To My Old Light Switches? For most of us the idea that, if it isn't broken, don't fix it, works fine in most cases. However, that concept doesn't really apply to upgrading to new technologies. Our old phones worked just fine, yet all of us upgraded to smartphones and continued to do so when newer models are available. There is a good reason for opting for smart light switches, and it's not just convenience. Smart light switches play a huge role in reducing our electricity bills. It also provides a sense of security and helps in the overall integration of all of our daily use items. How Does Smart Light Switch Factor in a Smart Home? The smart light switch is just a small cog in a much greater system. Smart light switches are the building blocks on which a fully integrated and interoperable smart home operates. It provides connectivity with smart lighting, smart cooling and heating, and smart security systems, and offers absolute control over the home via a simple smartphone app. This interconnectivity allows the local network to generate data over the home occupant’s behavioral patterns and slowly allow the home to become fully automated for most of the daily mundane activities based on pattern recognition. How to Deal with Multiple WAP Environments? Most homes will have multiple wireless access points or WAP in order to ensure complete Wifi coverage of the home. This shouldn’t be much of an issue as despite the number of WAP, you can maintain a single local network for your home, which the WAP leads to. So irrespective of the WAP used by a device, it will still connect to the central virtual network that connects all of the devices together. How Do I Deal with Intermittent or Patchy Wi-Fi Network? There are a number of things that can deal with this issue. First of all, most routers have a limit on the maximum number of devices that can connect to it. If you exceed this number, it may cause some devices to get dropped from the network. Check your router's specification and either upgrade to a router with a greater limit for connections or opt for a smart hub. As for the quality of the Wi-Fi connection, you simply have to take into account the location of the devices and make sure they're not obstructed by furniture, especially by metal columns. Metal can create severe interference in Wi-Fi signals. In rare circumstances, you'll notice that remote access to your smart light switch fails. In such cases, you can go into the settings tab in the smartphone app and make sure remote access is enabled. Check if your internet connection is strong enough to handle remote access, weak signals or a slow connection will be unable to handle remote access. Lastly, you can restart your device. It will reset it to its factory settings. All of the smart light switches reviewed above were chosen due to being the best smart light switch. So if you are to choose between them, then there are a few factors you can take into consideration. First of all, do you simply want control of your light switches or are you working towards turning your home into a complete smart home? If you just want to install smart light switches, you can opt for one of the switches that work without a smart hub. Otherwise, you would need a hub to connect all of the devices. For example, the Z-Wave platform is an excellent choice for a complete smart home, as it supports a wide array of smart home devices that will seamlessly sync together and share data with the central network based around a smart hub to ultimately give you the perfectly integrated and interoperable smart home.